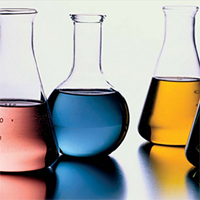 Solvents can be applied into use as a raw material in a wide variety of products ranging from cleaners & degreasers, paints, resins, varnishes, thinners and adhesives, to personal care products (Shampoos, Face Creams) and pharmaceuticals. De-icing agent for Liquid Fuels, Lacquers, Extraction process, Dehydrating agent, Preservative, Denaturant, and Organic Solvent. In the paint industry, Solvents are liquids or mixtures of liquids that dissolve resin and carry pigments and other paint components. Chemicals under this category are used as an integral part of paint formulation.